Casseroles don't make an appearance very often in my kitchen. I have a few go-to casserole recipes, but not many. I'm not quite sure why that is. It could have something to do with the fact that my girls don't always like their food all mixed together. They like to see exactly what's on their plate. I think they feel like I'm trying to "hide" something super healthy in there! Our conversation about this dish went something like this -- Me: "It's noodles AND cheese, both of which you love!" (utilizing the power of suggestion here) Them: "What about that white stuff?" Me: "Oh, that's another kind of cheese that you've eaten before and liked." Them: "If you say so..." After they gave it a few more pokes and prods with their forks, they dug right in. And of course, they loved it. This is one of those dishes you can make in advance and keep in the refrigerator until you're ready to cook. I made this one morning when I knew there would be no afternoon prep-time for dinner. I needed something that I could just pop in the oven when our after-school activities were over. For the sauce, brown the ground chuck and drain. Add the tomato sauce, garlic, salt, and pepper. Let the mixture simmer while you prepare the rest of the ingredients. In a separate bowl, combine the sour cream, cottage cheese, green onions, and additional pepper. Add the cooked noodles and stir to coat. Add half the noodles to a 9x13 baking dish. Top with the meat mixture and half of the cheddar cheese. 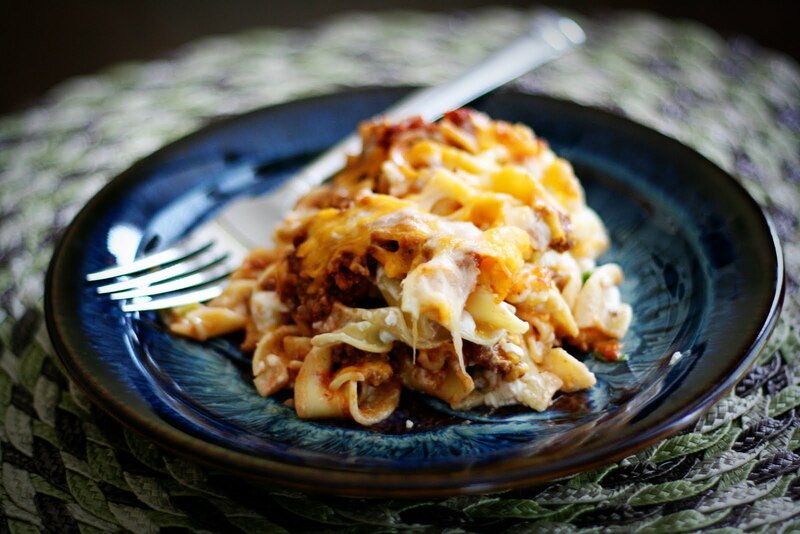 Repeat the layering with more noodles, meat mixture, cheddar cheese, and mozzarella. Bake at 350 for 20 minutes or until cheese is melted. Preheat oven to 350 degrees. Cook egg noodles until al dente and drain. Brown the ground chuck and drain. 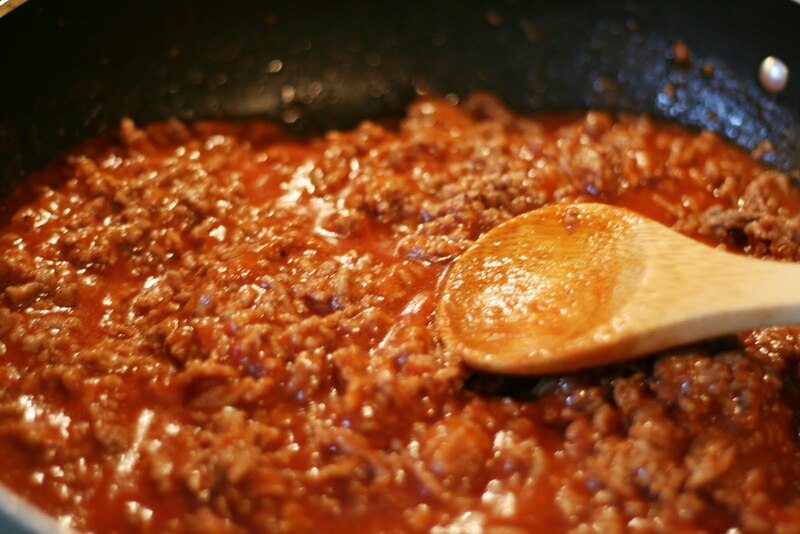 Return the meat to the pan and add the tomato sauce, garlic, salt and 1/2 tsp. pepper. Simmer this mixture while you prepare the rest of the ingredients. 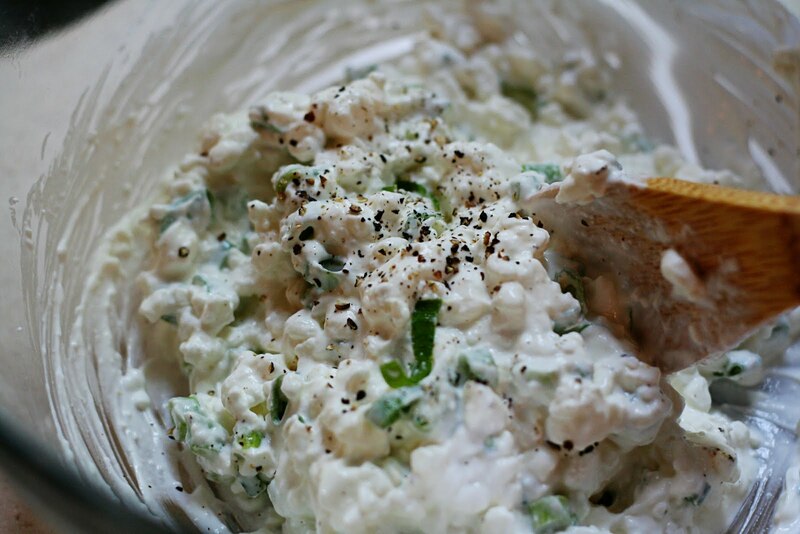 In a separate bowl combine the sour cream, cottage cheese, green onions and 1/2 tsp pepper. Add the cooked egg noodles and stir to coat. Add half the noodles to a 9x13 baking dish. Top with the meat mixture and half of the cheddar cheese. Repeat the layering with more noodles, meat mixture, cheddar cheese and mozzarella. Bake at 350 for 20 minutes or until cheese is melted. Mary, this website is beautiful. I am so hungry after exploring it!!!! I'm glad your girls liked it!